Russian culture – русская культура (roosskaya kultoora) – experienced a golden age in the 19th century, followed by a silver age in the 20th century, producing, during these two centuries, an enormous amount talent. Besides, it is possible to learn something about Russian culture, even if you have not been to Russia. In fact, Russia has produced several world-famous celebrities – знамени́ты (znamineetee). 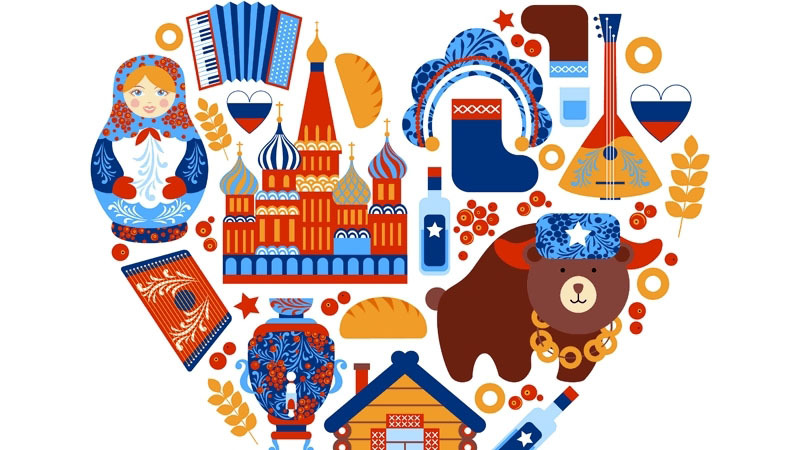 CREF would like to present a small review of Russian culture, accompanied by some useful vocabulary. You have probably heard – слы́шали (slishali) about at least one of the following artists: Chagall, Tchaïkovski, Dostoïevski and Stanislavski. Marc Chagall – Марк Шага́л (Mark Shagal), the painter – живопи́сец (zhivopisséts), is easily recognizable – легко́ узнава́емый (leghko ooznavayemee); he is the man behind the ceiling mural at the Garnier Opera in Paris, with its depictions of soft-featured characters that appear to be floating in the air. He works in Moscow, then Paris, then New York, returning to France after 1945. It is André Malraux, the Minister of Culture at the time – министр культуры (ministr koultoury), who engages his services to paint the ceiling – плафо́н (plafown) of the Garnier Opera in 1964. You are most likely already acquainted with a few works – произведе́ния (praïzvédiénia) by Russian painters, like Black Square – чëрный квадра́т (Chorny kvadrat) by Casimir Malevitch, and with at least one painting – картина (kartina) by Vassili Kandinsky (born in Moscow, died in Neuilly-sur-Seine), composed of interlocking geometric figures. There are many more such works, waiting to be discovered, at the Tretyakov National Gallery – Третьяковская Галерея (Tretyakovskaya Galéria) in Moscow, for example. Musicologists – музыкове́ды (moozikavedi) generally place Piotr Tchaikovsky – Петр Чайковский in a separate category because his music, they claim, is closer to Western music than to the clearly Russian music of his contemporaries, like, for example, Mussorgsky. As a composer – композитор (campazeetor), he has bequeathed to music lovers symphonies – симфонии (simfonii) and piano concertos – концерты для фортепиано (contserty dlia fortepiano) that will likely endure until the end of time. Truly, Swan Lake, The Nutcracker and Sleeping Beauty are world-renowned ballets – балеты (balyetee), and their music has been incorporated into countless movies, documentaries and even commercials. Two of his operas – оперы (operee), The Queen of Spades and Eugene Onegin, are found in the repertory – репертуар (same pronunciation) of practically every Russian theatre company, and the greatest artists – исполнители (ispalnitelee) of the international opera scene have performed in them, without even knowing Russian. Besides Tchaikovsky, one could also mention the names of other composers of international renown, like Mussorgsky, Borodin, Rachmaninov, Shostakovich, Prokofiev, or even Igor Stravinsky – Игорь Стравинский. This last one wrote three famous ballets for the Russian Seasons of Serge Diaghilev – Сергей Дягилев, at Châtelet in Paris: Firebird, Petrushka and the Rite of Spring. Stravinksy moved to Paris in 1920 and, on his death, was buried in Venice, according to his wishes; he was close to the “group of six”, created by Éric Satie and Jean Cocteau. It is impossible to talk about classical music – классическая музыка (classicheskaya moozika) without also discussing some world-famous Russian performers. At the beginning of the 20th century – just as one cheered the baritone voice of Fedor Chaliapin – Фдор Шаляпин (Fyodor Shaliapin), now one applauds that of the soprano Anna Netrebko – Анна Нетребко. In Paris, during the Russian Seasons – русские сезоны (russkie sezonee) era, prima ballerinas – солисты балета (solistee baleta) Anna Pavlova and Vatslav Nijinsky were the focus of public adoration, well before Rudolf Nureyev, who fled Soviet Russia in the 1960s, only to become a star on the French scene. Russia has also produced a number of musical virtuosos – виртуозы (virtuozee). Cellists – виолончели́сты (vialantchelistee) from all over the world continue to revere the art of Mstislav Rostropovich – Мстисла́в Ростропо́вич (Mstislav Rastraspovitch), another Paris-based political exile, who played in Berlin during the fall of the wall in 1989. In terms of literature – в литерату́ре (v literatooreh), too, there is an abundance of choice, from Sophie’s Misfortune by the Countess of Segur (admittedly, her works are not widely known in Russia) to Dr. Zhivago by Pasternak and Solzhenitsyn’s Gulag Archipelago! Feodor Dostoevsky – Фëдор Достоевский (Feodor Dastayevsky) is undoubtedly one of the most widely read authors in the world, with works like The Idiot, Crime and Punishment, and The Brothers Karamazov, to name just a few of his masterpieces – шедевр (shedevr). His fans – поклонники (paklonniki) generally prefer him to those of comparable fame like Leo Tolstoy – Лев Толстой (Lev Talstoi). His novels – романы (ramany), War and Peace and Anna Karenina, have had several screen adaptations – экранизировали (ekraniziravali), and have even inspired operas and musicals – мюзыклы (miouzikli). Ivan Turgenev – Иван Турге́нев (Ivan Turgeniev), a fervent supporter of the abolition of serfdom, and whose house-museum – дом-музей (dom-moozei) is located in Bougival, on the outskirts of Paris, is cited less often. He was a friend of Merimée and Flaubert, Georges Sand and Zola, whom he would publish in Russia. As for theater – театр (teyatr), Anton Chekhov’s – Антон Чехов (Anton Chekhov) – Three Sisters – три сестры (tri sistree) is undoubtedly the most oft-performed Russian play in the world. The piece, a product of the Moscow scene, was created by Constantin Stanislavsky – Константин Станисла́вский (Constantin Stanislavsky), who developed acting methods – техника игры актеров (tekhnika igree aktyorav) that revolutionized theater throughout the Western world – западный мир (zapadni meer). Just as Stanislavsky was busy revolutionizing theater, so too director Sergey Eisenstein – Серге́й Эйзенште́йн (Sergei Eizenshtein) became an essential source of inspiration and influence for all aspiring directors of cinema – кинорежиссëр (kinarezhissiyor), due to his editing techniques, as well as a result of his theories – тео́рии (teyoree) on theater and cinema. Finally, among sculptors – ску́льпторы (skulptory), one can cite the name of Ossip Zadkine – Осип Ца́дкин, who, at the age of 20, rose to fame in Paris in 1910, and Mihail Chemiakin – Михаи́л Шемя́кин, an artist of multiple talents – тала́нты (talantee), who was exiled from the USSR, returned some time later, only to move to France shortly thereafter. Although he was a sculptor, he also staged several ballets at the Mariinsky in St. Petersburg. If none of these names – имена (imiéna) look familiar – знакомое (znakomaïé), try looking up their works, and you will be surprised to discover that you already know quite a few! The list is actually quite long, and that’s not even taking into account the artists of today, some of which already look quite promising – – многообеща́ющие (mnaga-abeshshaiyooshshee).